OMG. It's only 6 something in the morning and I'm already wide awake. Haihh... It's a Sunday morning. I think I am having Ho Pa Pa's syndrome. Wake up early in the morning, watch tv (or do some random stuff) then go back to sleep later on. I am mentally very tired but no matter how I tried to roll left and right to find a comfy position, I can't seem to fall asleep again. Tsk tsk tsk. Decided to update by poor abandoned blog :) Sorry my dear blog. Went for Shabu Shabu with colleagues and Jullian last Thursday (I know, it's LAST THURSDAY!!). I visited this place with Cass last year and it wasn't quite nice though. But me and her had one hell of a good time stuffing our stomach with food. Hehe. When Chan suggested shabu shabu at Puchong, I thought it will some other place instead of this since he said it's nice. But when I showed him the shabu shabu place that I know at that area, he said "yeah yeah yeah. It's this one. OMG I'm so happy". Since we have reached that place, I have no choice but to convince myself "Maybe it will be better this time". Hehe. I forgot the name of the restaurant but it has moved to the other end of the same row of shop. 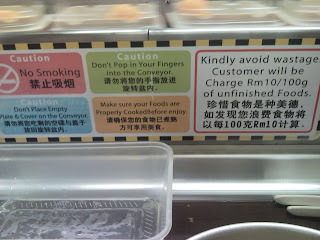 I think it's to accomodate more customers, especially during the weekend. Everything remained the same though. I think the price increased a lil bit. What you are about to view is totally not my creation. It's real. This... my dear friends, were the amount of vegetables that Chan grabbed from the revolver. Oh, did I mention that it's for 2 person which is for me and him? 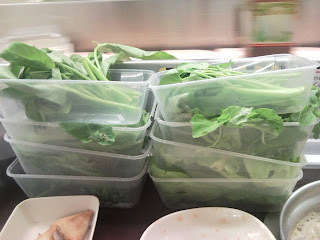 Suk Yee and SW have nearly the same amount of vegetables to finish, thanks to Chan as well. Jullian said he's not a big fan of vege except those cooked by his mum, was spared from this vege frenzy. 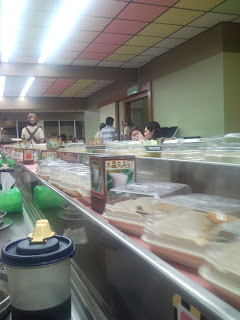 At one point, I thought I was having vegetarian steamboat OR I have transformed into a cow OR my skin is turning green. Chan's slogan for the whole meal was "vege is good for health" and he will placed a few vege on your pot. Basically my stomach that night was filled with fishballs and meat the lower half and vegetables on the upper half. It's that crazy!! Each seat comes with individual heat controller. 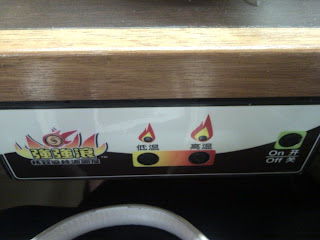 When I reached my seat, no matter how many times I pressed the button, it will not turn on. I thought it was spoilt but then when Jullian pressed the On/Off button for me, it works! I think the heat controller don't like me :( humphhh!!! Some instructions that were placed just right in front of me. It served like a constant reminder to me the whole night to finish the vege -_-"
That's the end of the Shabu Shabu experience. Overall, I think it's still the same as the first time I visited that place with Cass. I would love to try another shabu shabu at the other side of shops and the one at NZX. Have been reading a lot of reviews for these 2 places. Girls :) let's go makan-makan trip. Eh wait, Tsuey Wenn don't like steamboat. Cis... maybe I will request one of these 2 places for my birthday dinner :) Hehehe. Last Sunday was the day my parents meet Brandon kor kor's parents for the first time to discuss about the wedding and also taste the wedding dinner's dishes. I totally love the way they placed the plates. The shade of pink colour is really really nice. Did not take photos of the food because I don't want to reveal the dishes for the wedding dinner before the actual day :) Overall, I would rate it as okay only. By the time they served the 3 dish, I was already full. 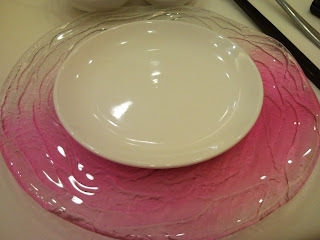 Throughout the dinner, I've learned some funny tradition or preparation or rules for Chinese wedding. It's really funny but interesting at the same time. I asked a lot of questions as if I'm the one getting married. Haha.